Gladiolus are known by a number of names: Gladiolus, gladiola, "glads", and even "Sword Lilly". Why Sword Lily, you might ask? It's because of their long, sword-like leaves. But, Glads are not members of the lily family. Whatever you like to call them, they are one of the more popular flowers grown in the home garden. Gladiolus are native to the mountains of South America. They are widely grown in the U.S. and Europe. Growing Gladiolus is easy. They make for a beautiful flower in the garden and in floral arrangements, hence their popularity. With just a little attention, your glads will burst into a bloom of tall spikes in July or August. Blossoms come in a wide range of colors and bicolors, including blue. The blossoms will open from the bottom first. Harvest spikes of Gladiolus just before the top blossoms open. The top blossoms will open indoors. Did you know? You might think that Gladiolus grow from bulbs....wrong! They actually grow from a closely related cousin, the "corm". See more on Bulbs, Corms and Rhizomes. Plant Gladiolus in the spring. They can be grown in rows, or bunches. They will tolerate a little crowding, but will grow bigger if spaced out. Gladiolus plants prefer a rich, soft soil, and plenty of water. While they prefer full sun, Gladiolus will still grow well in partial shade. My glads receive full morning sun before being shaded by the house in the afternoon. A little fertilizer helps to stimulate growth, especially if the soil is poor. Once planted, your gladiolus should grow well with little attention. Add mulch to help retain water, and to keep the weeds down. 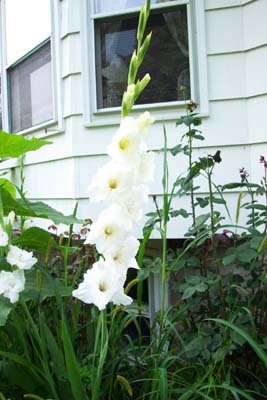 Gladiolus will grow three to four feet tall, but are not a sturdy plant. The heavily flowered spikes, are susceptible to bending and breaking. Provide protection from the wind, if possible. Tie the spikes to plant stakes, to avoid wind damage. You're probably well familiar with bulbs, which reproduce baby bulbs below the mother bulb. Corms, on the other hand, produce new corms on the top of the mother corm. In the fall, dig up gladiolus corms. Separate the corms. Wash and dry them. Then, put them in a cool, dry and dark place until planting time arrives next spring. Tip: If you are planning a color-coordinated design for your flower garden, sort corms by color, before putting them away. Flower Gallery Pictures of your favorite flowers..